That is the finding of what was due to be a definitive audit of land ownership released, in abbreviated form, on Thursday, after it was approved by Cabinet earlier this week. The department of rural development and land reform, which was responsible for the massive audit, said full details of the findings would be available shortly, but could not be more specific by Thursday afternoon. The audit provides a breakdown of land ownership by type, showing how much land is owned by private individuals, organisations, ­traditional authorities and different ­levels of government, but it makes no ­finding on the race of the owners. It also does not show how much land is in foreign hands. Though it will continue to attempt to provide such breakdowns, the office of the surveyor general said that data on the race and nationality of land owners was not available. The startling extent of land parcels for which there is no ownership information is likely to cloud the ongoing debate around land restitution further. In the Eastern Cape, more than four-million hectares are officially unaccounted for, about 24% of the province. In Gauteng, that figure is 18%, and in Mpumalanga it is 13%. Because traditional land, such as that under President Jacob Zuma’s Nkandla homestead owned by the Ingonyama Trust, is classified as government-owned, the extent of such holdings varies wildly between provinces. 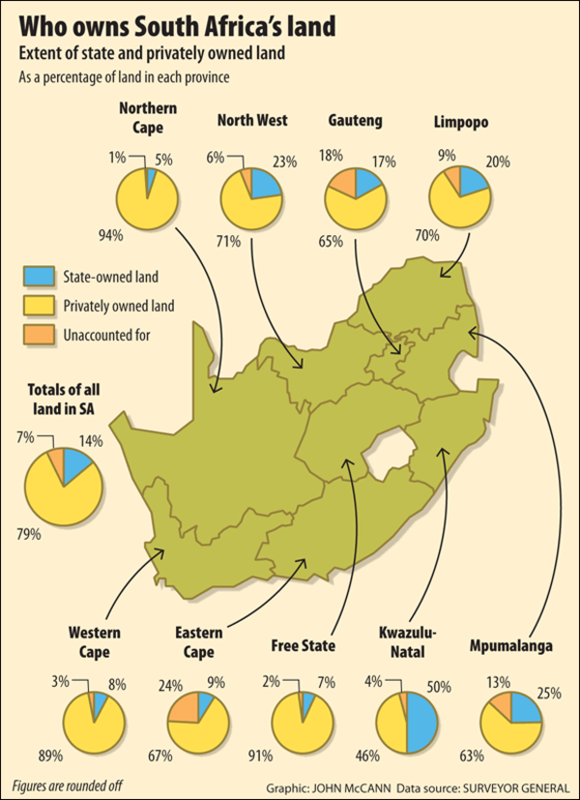 In KwaZulu-Natal, the surveyor general said, 50% of land is owned by the state. In the North West and Mpumalanga, about a quarter of land is in state hands. By contrast, 94% of the Northern Cape was found to be in private hands. The classification of land usage, based on reports from field workers who visited 1.15-million separate land parcels, according to the surveyor general, also makes for a wildly mixed bag. In KwaZulu-Natal and Limpopo, traditional authorities were the biggest land users. In the Northern Cape and Western Cape, municipalities used more land than any other group, whereas national government departments dwarfed other land users in Mpumalanga, the Free State and the Eastern Cape. In the remaining two provinces, Gauteng and North West, the biggest land user is classified as “unknown”. According to field workers, just more than two million hectares of land remains undeveloped.